Gumball 3000 2013 Tuning carried out by Viezu – Super Car tuning We at Viezu are extremely proud to have provided Super Car tuning for the illustrious Gumball 3000 2013. Gumball 3000 is by far the most celebrated and extraordinary of road trip adventures in the world. Any Super Car taking part in such a peerless event deserves the very best in tuning technologies, in which Viezu hits the mark. When it comes to Super Car engine tuning including Lamborghini tuning, Porsche tuning and Ferrari tuning, Viezu are the global leaders. All of our Super Car maps are made in-house by our dedicated team of Super Car technical specialists. 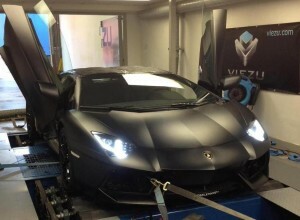 We’ve acquired our high standard of Lamborghini tuning, Porsche tuning and Ferrari tuning knowledge and remap expertise by heavily investing in research and development of Super Car ecu remapping, and by honing our skills with countless Super Car dyno runs on our Mustang dynamometer rolling road. Viezu put our customer’s needs first and will do our very best to meet your requirements. If you’re after an increase in throttle response and performance, our prestigious Super Car custom performance tuning will seriously improve the drivability of your Super Car augmenting it with va va vroom and bite. Whatever your Lamborghini tuning, Porsche tuning and Ferrari tuning requirements we will create a bespoke remap tailored for your Super Car.